Journal of Nanjing Agricultural University, 2019, 42(2): 209-219. 黄鹭, 黄颜众, 轩慧冬, 等. 大豆GmMYB46基因的克隆、定位及表达分析[J]. 南京农业大学学报, 2019, 42(2): 209-219. 通信作者：邢邯, 教授, 博导, 主要从事大豆育种研究, E-mail:hanx@njau.edu.cn. Abstract: [Objectives] In this study, the structural features and localization of the MYB transcription factor gene GmMYB46 were analyzed. Expression patterns of GmMYB46 under different stresses were tested, which can be applied to the further study of stress effect of soybean. [Methods] The CDS sequence of GmMYB46 was cloned from the soybean variety 'Jindou 21', and the gene and its encoding protein were analyzed by bioinformatics methods. The GmMYB46 gene promoter motif element was analyzed by using the PlantCARE software. 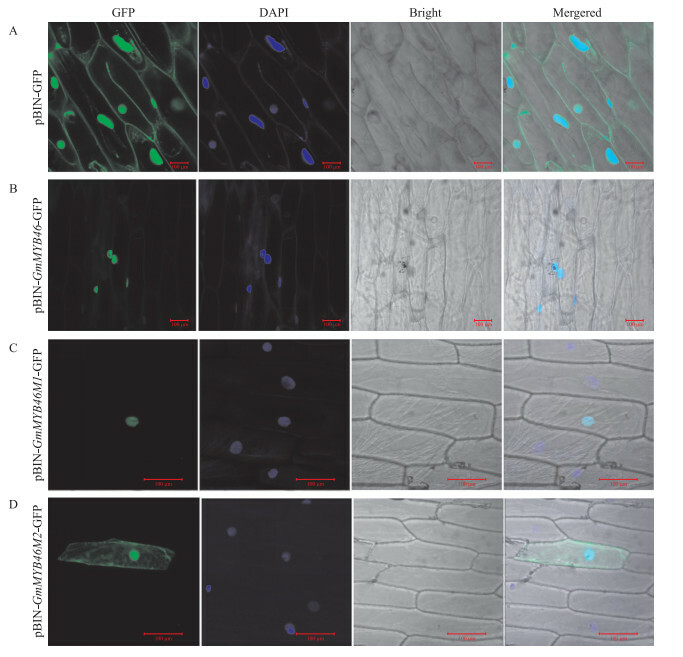 The subcellular localizations of the full-length and different domains of M1(aa1-123) and M2(aa124-334) of GmMYB46 protein were analyzed by the onion epidermal cell transient expression system. The expression of GmMYB46 under different stress treatments were studied by RT-qPCR. [Results] Full-length CDS sequence of GmMYB46 was 1 005 bp, encoding 334 amino acids, and the relative molecular mass of MYB46 protein was 82.53×103. 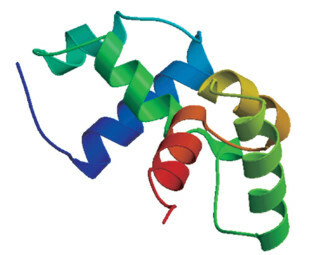 Domain analysis showed that the amino acid sequence contained two highly conserved SANT domains. Phylogenetic tree analysis showed that GmMYB46 was highly homologous to GsMYB46 from Glycine soja. The promoter element analysis showed that GmMYB46 contained stress responsive elements, such as MBS, ABRE, GARE, TCA and LTR. The subcellular localization results showed that the fusion protein of pBIN-GmMYB46-GFP and pBIN-GmMYB46M1-GFP were located in the nucleus, but the fusion protein of pBIN-GmMYB46M2-GFP was expressed in the whole cell. Quantitative PCR(qPCR) analysis showed that the transcription level of GmMYB46 in soybean root, stem and leaves was upregulated under the drought, salt(200 mmol·L-1 NaCl), cold(4℃), ABA(200 μmol·L-1), SA(500 μmol·L-1) and GA(100 μmol·L-1) treatments. [Conclusions] The conserved domain of GmMYB46 played a crucial role in subcellular localization and the gene might be involved in stress response. Note: The underline indicates cleavage site, GGTACC indicates cleavage site of kpnⅠ, GGATCC indicates cleavage site of BamHⅠ. 图 1 GmMYB46的PCR扩增产物 Fig. 1 PCR products of GmMYB46 M. DNA marker; CK.对照Control(H2O); 1. GmMYB46的PCR产物Products of GmMYB46. 图 2 GmMYB46与其他物种MYB氨基酸序列的多重比对 Fig. 2 Amino acid alignment of GmMYB46 with MYB amino acid sequences from other plant species 1)Repeat2表示保守的R2结构域; Repeat3表示保守的R3结构域。Repeat2 indicated R2 domain repeat; Repeat3 indicated R3 domain repeat. 2)Cc:木豆Cajanus cajan; Gs:野生大豆Glycine soja; Mt:蒺藜苜蓿Medicago truncatula; Pv:菜豆Phaseolus vulgaris; Va:赤豆Vigna angularis; Vr:绿豆Vigna radiata var. radiata; At:拟南芥Arabidopsis thaliana; Gh:棉花Gossypium hirsutum; Gm:大豆Glycine max. 图 3 GmMYB46和其同源蛋白的系统进化树分析 Fig. 3 Phylogenetic tree analysis of GmMYB46 and other homologous protein Gm:大豆; Gs:野生大豆; Ca:鹰嘴豆; Pv:菜豆; Va:赤豆; Vr:绿豆; Mn:桑树; Me:木薯; Pt:白毛杨; Zj:栆; Jc:麻风树; Pa:樱桃; Dz:榴莲; Tc:可可; Gh:棉花; Cc:木豆; Mt:蒺藜苜蓿; Tp:三叶草; Hu:哥伦比亚锦葵。图中数值表示Bootstrap值, 数值越大分支可信度越高。 Gm:Glycine max; Gs:Glycine soja; Ca:Cicer arietinum; Pv:Phaseolus vulgaris; Va:Vigna angularis; Vr:Vigna radiata var. radiata; Mn:Morus notabilis; Me:Manihot esculenta; Pt:Populus tomentosa; Zj:Ziziphus jujuba; Jc:Jatropha curcas; Pa:Prunus avium; Dz:Durio zibethinus; Tc:Theobroma cacao; Gh:Gossypium hirsutum; Cc:Cajanus cajan; Mt:Medicago truncatula; Tp:Trifolium pratense; Hu:Herrania umbratica. The value indicated Bootstrap value, the bigger the value, the higher reliability of branch. 图 6 GmMYB46启动子区域的部分顺式作用元件 Fig. 6 Keycis-acting elements of the GmMYB46 promoter TSS:转录起始位点; CCGTCC-box:与分生组织特异性激活有关的顺式调控元件; P-box、GARE-motif:赤霉素反应元件; ABRE:参与脱落酸反应的顺式作用元件; TCA-element:参与水杨酸反应的顺式元件; MBS:MYB的结合位; LTR:参与低温响应的顺式作用元件。 TSS:Trancriptinal start site; CCGTCC-box:cis-acting regulatory element related to meristem specific activation; P-box, GARE-motif:Gibberellin-responsive element; ABRE:cis-acting element involved in the abscisic acid responsiveness; TCA-element:cis-acting elementinvolved in salicylic acid responsiveness; MBS:MYB binding site; LTR:cis-acting element involved in low-temperature responsiveness. 图 8 R2R3型MYB转录因子高度保守的DNA binding结构域 Fig. 8 Highly conserved DNA binding domain of R2R3-MYB transcription factors A.高度保守的R2结构域; B.高度保守的R3结构域; 黑色星号表示保守氨基酸残基。 A. Highly conserved R2 domain; B. 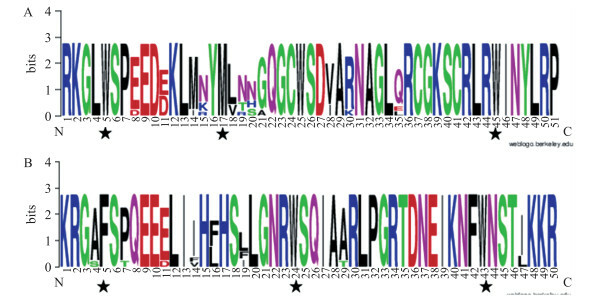 Highly conserved R3 domain; black star indicated conserved amino acid residue. 图 9 GmMYB46全长和各不同结构域片段的示意图 Fig. 9 Schematic diagram of full-length GmMYB46 and various domain of GmMYB46 FL表示GmMYB46全长(aa1~334);M1表示只含有MYB结构域的片段(aa1~123);M2表示不含有MYB结构域片段(aa124~334), 2个黑框代表 2个重复的MYB结构域。 FL represents the full-length of GmMYB46(aa1-334);M1 represents MYB domain(aa1-123);M2 represents the fragment without MYB domain(aa124-334).The two black boxes represent the two repeat units of MYB domain. 图 10 GmMYB46蛋白亚细胞定位分析 Fig. 10 The analysis of subcellular localization of GmMYB46 A. pBIN-GFP蛋白定位; B. pBIN-GmMYB46 -GFP融合蛋白定位; C. pBIN-GmMYB46M1 -GFP融合蛋白定位; D. pBIN-GmMYB46M2 -GFP融合蛋白定位。图中标尺代表 100 μm。DAPI是一种核染料, 作为阳性对照。 Micrographs showing cells expressing:pBIN-GFP(control, A); pBIN-GmMYB46 -GFP fusion protein(B); pBIN-GmMYB46M1 -GFP fusion protein(C); pBIN-GmMYB46M2 -GFP fusion protein(D). Scale bar represented 100 μm. DAPI is a nuclear dye that serves as a positive control. 图 11 不同胁迫下GmMYB46基因的表达分析 Fig. 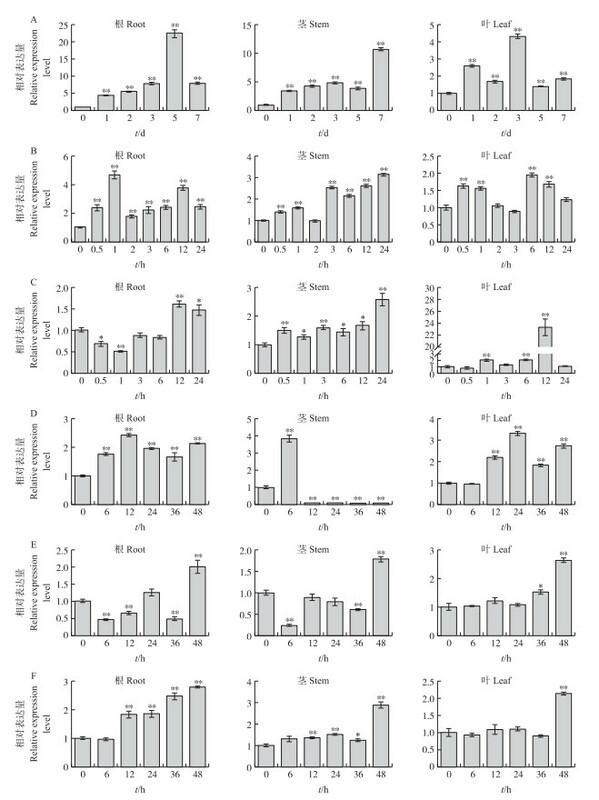 11 Expressions analysis of GmMYB46 gene under different stresses A.干旱胁迫Drought stress; B. 200 mmol · L-1 NaCl; C. 4 ℃; D. 200 μmol · L-1 ABA; E. 500 μmol · L-1 SA; F. 100 μmol · L-1 GA.*P＜0.05, * *P＜0.01. Wang H Y, Wang H L, Shao H B, et al. Recent advances in utilizing transcription factors to improve plant abiotic stress tolerance by transgenic technology[J]. Front Plant Sci, 2016, 7: 67. 许玲, 卫培培, 张大勇, 等. 大豆转录因子基因GmMYB111的克隆及功能分析[J]. 中国农业科学, 2015, 48(15): 3079-3089. 王春霞, 黄晨辉, 吴光耀, 等. 转基因烟草分析COP1亚细胞定位及各结构域的功能[J]. 科学通报, 2002, 47(7): 501-507. 潘婷, 邱全胜. N-端结构域决定拟南芥KEA1和KEA2的亚细胞定位及定位与功能的关系[J]. 中国科技论文, 2017, 12(18): 2124-2129. Huang C J, Hu G J, Li F F, et al. NbPHAN, a MYB transcriptional factor, regulates leaf development and affects drought tolerance in Nicotiana benthamiana[J]. Physiologia Plantarum, 2013, 149: 297-309. 朱秋萍, 郭春苗, 王娟, 等. 扁桃MYB46转录因子基因的克隆及其表达模式分析[J]. 植物生理学报, 2018, 54(4): 669-676. Zhu Q P, Guo C M, Wang J, et al. 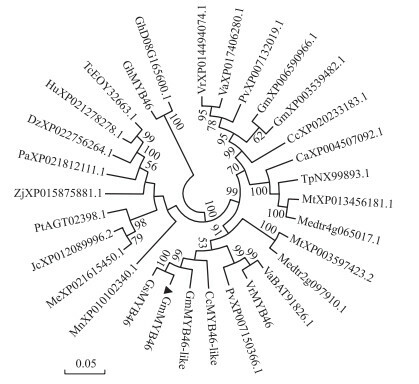 Cloning and expression patterns analysis of MYB46 transcription factor gene in almond[J]. Plant Physiology Journal, 2018, 54(4): 669-676 (in Chinese with English abstract). Yang W J. Cloning and expression of soybean MYB transcription factor gene[D]. Ya'an: Sichuan Agricultural University, 2007(in Chinese with English abstract). 杜海, 杨文杰, 刘蕾, 等. 大豆MYB转录因子基因GmMYBJ6和GmMYBJ7的克隆及表达分析[J]. 作物学报, 2008, 34(7): 1179-1187. Du H, Yang W J, Liu L, et al. Cloning and functional identification of the two MYB transcription factors GmMYBJ6 and GmMYBJ7 in soybean[J]. Acta Agronomica Sinica, 2008, 34(7): 1179-1187 (in Chinese with English abstract). Zhao M Z, Wang T L, Wu P, et al. Isolation and characterization of GmMYBJ3, an R2R3-MYB transcription factor that affects isoflavonoids biosynthesis in soybean[J]. PLoS One, 2017, 12(6). Cao L. Functional identification and regulation analysis of low temperature responsive CLMYB46 in watermelon[D]. Wuhan: Huazhong Agricultural University, 2017(in Chinese with English abstract). Rubio V, Linhares F, Solano R, et al. A conserved MYB transcription factor involved in phosphate starvation signaling both in vascular plants and in unicellular algae[J]. Genes & Development, 2001, 15(16): 2122-2133. Liang Y K, Dubos C, Dodd I C, et al. AtMYB61, an R2R3-MYB transcription factor controlling stomatal aperture in Arabidopsis thaliana[J]. Curr Biol, 2008, 15(13): 1201-1206. Jung C, Seo J S, Han S W, et al. Overexpression of AtMYB44 enhances stomatal closure to confer abiotic stress tolerance in transgenic Arabidopsis[J]. Plant Physiol, 2008, 146(2): 623-635. Al-Attala M N, Wang X, Abou-Attia M A, et al. A novel TaMYB4 transcription factor involved in the defence response against Puccinia striiformis f. sp. tritici and abiotic stresses[J]. Plant Mol Biol, 2014, 84(4/5): 589. 冯莹莹, 董先娟, 刘晓, 等. 白木香转录因子AsMYB1和AsMYB2克隆及表达分析[J]. 中国中药杂志, 2017, 42(17): 3305-3311. Feng Y Y, Dong X J, Liu X, et al. 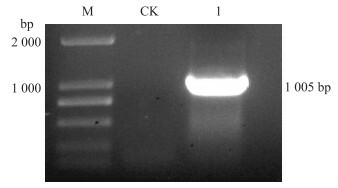 Cloning and expression analysis of transcription factor AsMYB1 and AsMYB2 from Aquilaria sinensis[J]. China Journal of Chinese Materia Medica, 2017, 42(17): 3305-3311 (in Chinese with English abstract).